Dental implants have been used predictably and successfully to replace missing teeth for decades. An implant is considered the best way to restore a missing tooth because it most closely resembles a natural tooth. It has a root form in the jawbone (simply called the implant or implant body), an abutment that projects out of the gums, and a crown that is built on the abutment to create a natural tooth shape. It restores the proper look and function of a tooth without depending on the surrounding teeth for support. Implants themselves have not changed much. What has changed is the technology surrounding the process of dental implants and their restoration, making it more accurate and more predictable. In order to provide the best possible result for your dental implant, Dr. Ann and Dr. Lauren use the latest technology available in dentistry to plan and properly execute the entire implant process. How does a 3D image make a dental implant better? Dental implants must be completely encased in the bone of the jaws in order to function as a tooth. A two-dimensional image (like a traditional dental x-ray) is not able to give the exact dimensions of the jawbone in a site that is proposed for placement of a dental implant. A three-dimensional image, like the CBCT image obtained by the PreXion Scanner, enables Dr. Ann and Dr. Lauren to measure the height, width, and length of an implant site, as well as the location of important surrounding anatomical structures. This includes nerves, sinus cavities, and other teeth. The importance of this pre-operative planning cannot be overstated. How does 3D technology make a dental implant better? Because an implant must be placed into adequate jawbone, it is common for the bone to be the only consideration made by some dentists when placing implants. At Designer Smiles, our doctors are different. In addition to digitally planning and visualizing the correct position of an implant on a 3D x-ray, Dr. Ann and Dr. Lauren are able to integrate the final crown’s size, shape, and position into the pre-operative planning. This creates an ideal situation where the angle and position of the implant properly absorb the chewing forces the final crown will undergo. An implant that is placed into healthy jawbone at an improper angle relative to the final crown will have a higher risk of failure in the long run. By planning the crown first, Dr. Ann and Dr. Lauren can design the entire implant system (implant body, abutment, and crown) for the best long-term success. How is Designer Smiles different from other dental offices where implants are placed? Many dentists place dental implants using only one implant system, which means they are limited by the number of sizes available. Because Dr. Ann and Dr. Lauren have been trained in multiple implant systems, they are able to more thoroughly customize your treatment and utilize every millimeter of bone available for implant stabilization. What is the process for a dental implant using 3D technology? Planning: The first stage is planning. Dr. Ann and Dr. Lauren will gather information about the proposed implant site, including a 3D CBCT image and a 3D intraoral scan. 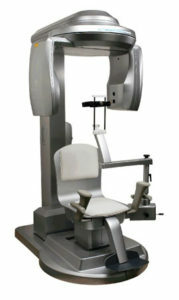 These only take a few minutes for the patient. The real work goes on behind the scenes. Dr. Ann and Dr. Lauren work with a certified dental technician to design the size, shape, contours, and position of the final crown. They can integrate the digital model of the crown into the CBCT software (the 3D x-ray of the underlying bone) to determine the appropriate position of the dental implant using the final crown as his guide. 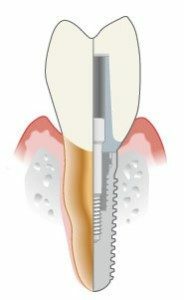 The final implant position is communicated back to the dental lab, which makes a tool called a surgical guide, which is useful in aiding implant positioning in complex cases. Restoration – Once the implant has healed and has adhered to the jawbone, it is ready to withstand chewing forces. 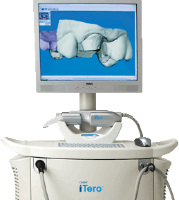 The implant, the adjacent teeth, and the opposing teeth are digitally scanned with the iTero® intraoral scanner. The three-dimensional digital model is then communicated to the dental lab technician, who creates the physical abutment and crown. The abutment and crown are fitted to the implant and permanently secured. Call our office at 281-667-4010 today to set up a consultation with Dr. Ann and Dr. Lauren. They will discuss the entire process with you, as well as any specifics that may be unique to your case.